The earliest NBA superstar, George Mikan was ahead of his time and his hook shot became the model for many big men to come. 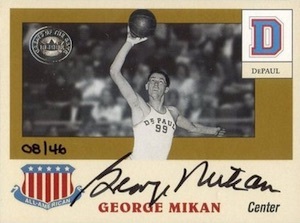 Although his vintage cards are very limited and many come from non-traditional sources, George Mikan cards are popular and, in many instances, quite valuable. 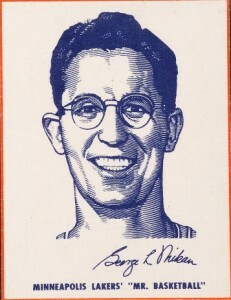 The list below features some of the best George Mikan basketball cards in history, including top modern options. 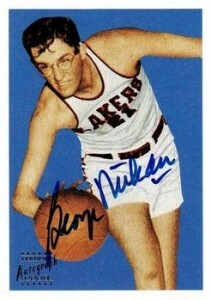 Shop for George Mikan Cards on eBay. 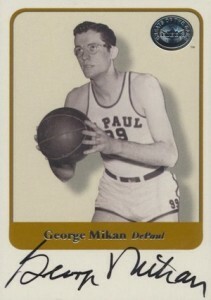 A major part of the early years in professional basketball, George Mikan enjoyed considerable success in the NBL and BAA/NBA after his college career at DePaul. 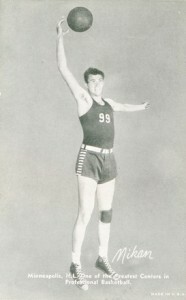 Standing 6'10", the dominant center won seven total league titles and is mostly remembered for his time with the Minneapolis Lakers. Mikan was inducted into the Basketball Ball Hall of Fame 1959 as a member of the very first HOF class. 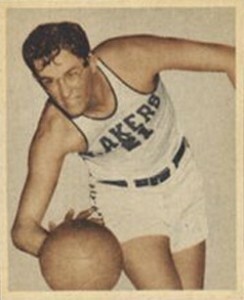 George Mikan passed away in 2005. While many elite athletes are credited with "changing the game" for their respective sports, that was literally the case for George Mikan. He was responsible for the introduction of goaltending rules in college and the widening of the lane in pro basketball. The league also instituted the shot clock a few years after teams started holding possession of the ball as long as possible when playing Mikan. Despite his basketball relevance, the cardboard options for Geoge Mikan are fairly limited. Outside of his 1948 Bowman rookie, the majority of the vintage releases are hand-cut cards from food boxes or cards that would be considered oddball by today's standards. While only a handful of cards exist from his playing days, more cards were produced in the 1990s and 2000s, including his first autographed cards and memorabilia cards. The top 15 George Mikan cards are covered below, with a heavy focus on his vintage releases and on-card autographs. Click on the listing or images to shop for cards on eBay. 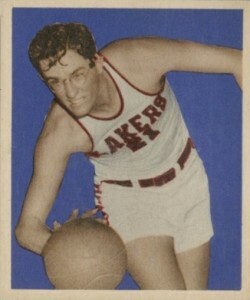 The first major basketball release came from 1948 Bowman and George Mikan's rookie is the key card from the set. Regarded by many collectors as one of the top basketball cards of all-time, the simple design features a vivid purple/blue background. Much less common, there is also a variation with a gray background. While poor grades can be found for lower amounts, mid-grades normally start in the thousands and a PSA 7 sold for $6,600 in 2014. 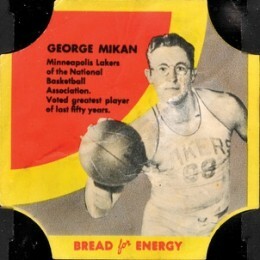 Although Bowman is the preferred option for many George Mikan collectors, it is not the only place to find Mikan's cards among 1948 releases. 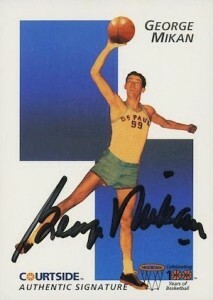 Small black-and-white cards were included in boxes of Kellogg's PEP cereal as part of a multi-sport set and Mikan is one of the key subjects. While they are more limited, the prices are much more reasonable than his Bowman card. However, high grades still command a considerable premium and a PSA 8 sold for $1,495 in January of 2015. Another undersized multi-sport release from 1948, Topps Magic Photos included various athletes and non-sport figures. The clarity has proven to be an issue for many of the cards. 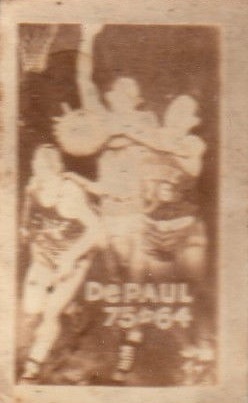 The George Mikan card is part of the Basketball Thrills subset and shows Mikan during his college days with DePaul and highlights a 75-64 win over North Carolina State in the 1947-48 NIT Quarterfinals. Produced by Exhibit Supply Co., the oversized 1948-49 Sports Champions set remains a great way to celebrate the full stature of George Mikan. The card has a more traditional feel thanks to the text at the bottom and even adds a facsimile autograph. The large cards have a blank back and were originally available in arcade machines. Found in specific loaves of bread in 1950 and 1951 and mostly associated with Fischer's Bread, these colorful end labels are a valuable vintage collectible for George Mikan. While the Bread for Health cards are somewhat rare, the Bread for Energy cards rarely surface. Some newer collectors may find the design familiar as Panini issued similar cards, including one for Mikan, in 2011-12 Past and Present. 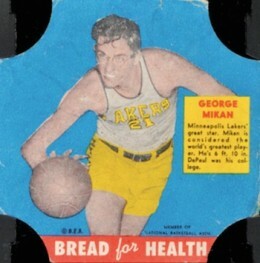 Moving from bread to potato chips, collectors could also find a George Mikan card in a 1950 Scott's Chips set that covered the Minneapolis Lakers. The narrow cards were issued in potato chip and cheese potato boxes. Like most regional vintage releases on the list, these George Mikan cards are rare. However, they are made even more rare because they could be redeemed for game tickets or an autographed team picture, which decreased the already-limited supply. A PSA 5 version sold for $6,300 in November of 2014. 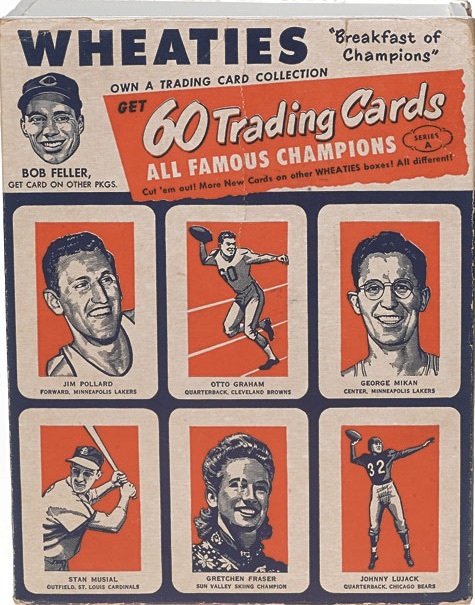 While Wheaties boxes are something that many collectors are familiar with, these cards released from 1951 and 1952 were actually hand-cut from the boxes themselves. The first card on the left is from 1951 and the remaining two are from 1952. An intact 1952 box is shown below the cards. 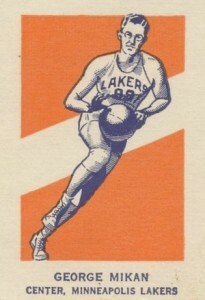 The cards from Wheaties are some of the most inexpensive vintage releases for George Mikan. 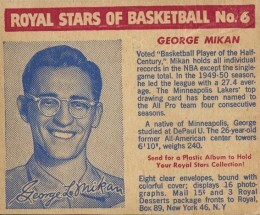 One of the final vintage releases for George Mikan, these rare cards were procured from the backs of Royal Desserts packages. 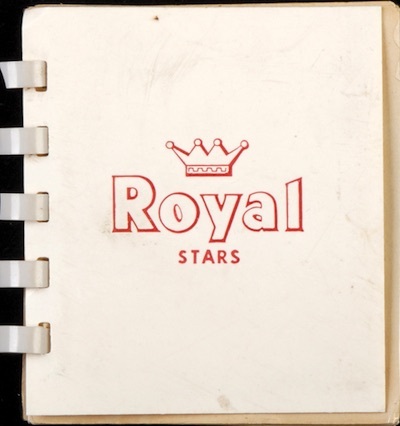 As seen on the card below, collectors could even obtain an album to hold the the eight-card basketball set by mailing 15 cents and three package fronts. Fast-forwarding four decades, 1992 Courtside Flashback brought collectors the earliest autograph for George Mikan. Showcasing "Mr. Basketball" in college, Courtside Flashback Autographs are one of the most affordable ways to obtain a signed card for George Mikan. Celebrating the NBA's top 50 players of all-time, 1996-97 Topps Stars included an insert set comprised of reprints for some of the most iconic basketball cards. 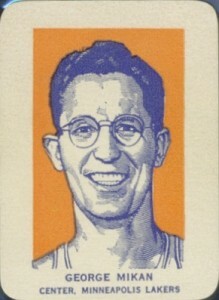 George Mikan's 1948 Bowman rookie is included among those reprints and there is also a signed version. These cards are some of the most readily available of all the George Mikan autographs. 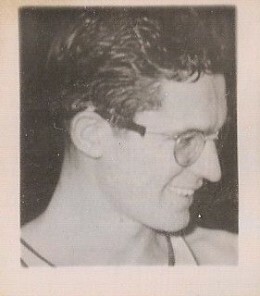 Several years would pass before more George Mikan autographs were featured in another basketball product. 2001-02 Fleer Greats of the Game included two signed cards for Mikan. The first is essentially a base parallel, reportedly short-printed to 300 copies. 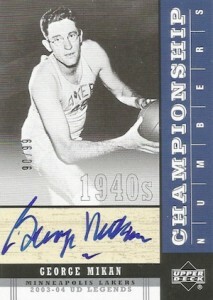 The classic design and on-card autograph makes for a very appealing George Mikan card. Considerably more rare than the base autograph in 2001-02 Fleer Greats of the Game, the All-American Collection Autograph parallel for George Mikan is hand-numbered to 46. Neither autograph surfaces often and the unsigned base versions for Mikan are obviously much easier to track down. 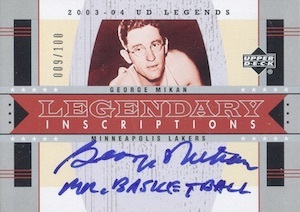 The last big influx of George Mikan autographs came in 2003-04 Upper Deck Legends. 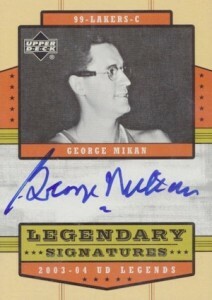 Legendary Signatures is the first of three distinct design options for George Mikan, and is his only signed card in the product that is not numbered. Basically a signed parallel of the Throwback cards, the Championship Numbers Autograph card for George Mikan is serial numbered to his jersey number (99). Limited to 100, the Legendary Inscriptions cards for George Mikan are some of his most valuable overall. In addition to his on-card autographs, these horizontal cards include his nickname, "Mr. Basketball." SPORTING LIFE CHEWING GUM Athletes Series #14 - George Mikan, Basketball Legend!